Thanks to United buddy passes, the flight expenses of our around the world trip are significantly lower. On the way down to South America we got very lucky and made it onto the first flight we were listed on, even got the exit row! Flying with United Buddy Passes mean we fly on Standby. And as anyone who’s flown lately knows, it’s rare to find a flight that isn’t full. The way back hasn’t been quite so easy for us. We left Cartagena on Friday at 3pm, after arriving at 8am. We booked a flight on a Colombian airline after we weren’t able to change our VivaColombia flight. We were excited to get to Bogota because the flight to Houston looked very promising. We checked in at the United kiosk since yhere was not a United desk or booth open. However when we checked in at the gate after sitting in BOG for 6 hours we were informed that we were supposed to have taken care of some sort of Colombian tax issue with a desk upfront. The gate agent was noticeably not a fan of us, and I had a bad feeling. Sure enough the 12 seats were given to others and at 2am we were escorted back through customs and told to try again for the 8:30am flight. Since check-in for the flight began at 6am we slept laid in the only available place, the uncomfortable plastic benches in the arrivals areas. Being a light sleeper I knew this wasn’t going to happen for me. After 30 minutes, or about 3:45 the arrivals area was a bustle of airport employees and the doors were propped open, allowing the 47 degree air to assault my exposed feet and ankles. I gave up after an hour and half heartedly read on my tablet while Ben snored on the bench in front of me. After seeing that both of the daily flights to the US were booked fully with long standby lists, I began contacting Airbnb listings in Bogota. As Ben awoke, I was convinced there was no way we’d make it on either the Houston or Newark flight, and exhausted and defeated I suggested we head to the apartment that would allow an 8am check-in time. All I could think of was sleeping. At 6:50am Ben argued that we may as well try for the Houston flight, even though it was full with 7 on standby. After we check-in and wait in the anxious stand-by area next to the check-in deak. I nervously check the United website every 5 minutes or so, and 50 minues before the flight I see we’re numbers 4, 5 on the list of 12. I curse each person who runs up to the gate right at the 45 minute bag cut off, I count 7. Those could have been our seats! Finally the first three names on the list are called and given seats. And as our names are called an ear to ear grin takes over my face, but quickly vanishes when we’re told we don’t actually have seats. Yet again we’re going through customs and security, but we don’t actually have seats. “This feels like a mean joke” I say to Ben as we wait in the longest customs line I’ve ever seen at a South American airport. 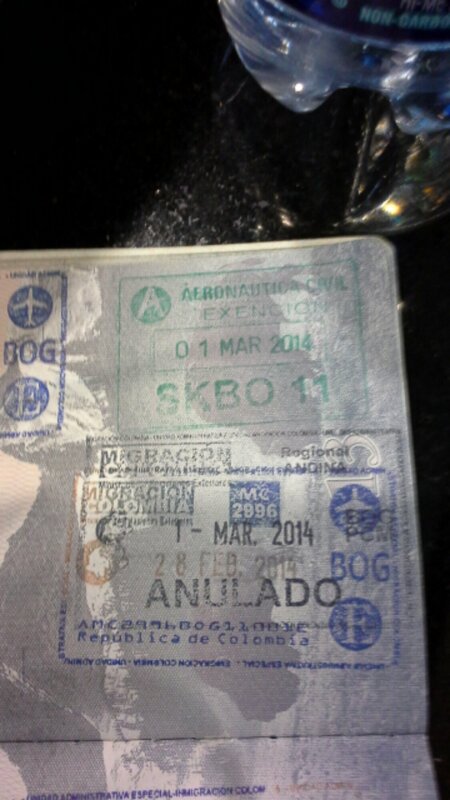 Another passport stamp that will probably be followed by another anulado stamp. Sure enough after clearing security and sprint to the gate, the agent says no. But urges us to try the Newark flight at the neighboring gate. The Newark flight that is overbooked by 2 seats. The gate agent nods in recognition, the same guy who was chatty with us as he checked us in. The same guy who told us weekends are really bad for flying standby. You were right dude! But fortune smiled down upon us, apparently several people didn’t show for the flight. Our names jump to the top positions on the Newark standby list, and we receive the only 2 standby seats. 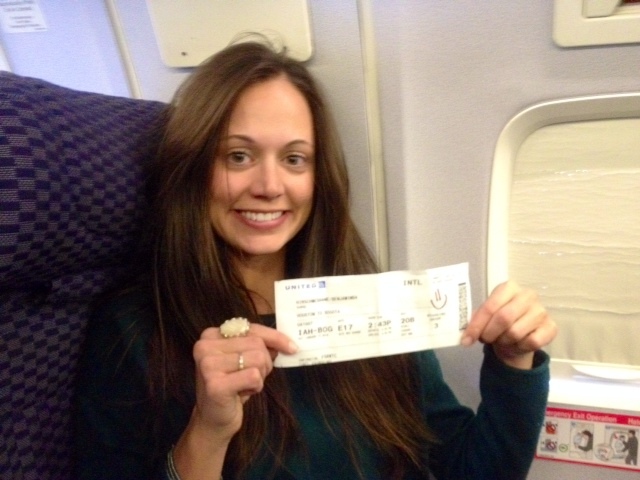 I’m giddy with excitement as I take my middle seat, and glancing to the row behind me flash Ben a big smile. By the time the wheels were up I was asleep, dreaming of a hot shower in the United States. 5 hours later we landed in good ole ‘Merika, immediately recognizing the rude shouts of Immigration amd TSA workers. “What were you doing in Colombia for two months? ” the Immigration officer questions. “Oh just setting up my Global drug trade business”, I wanted to say but instead explained we were traveling around both Ecuador and Colombia as tourists. Still only hearing the name Colombia she smirks, “Oh yeah? And how was that?” ending the sentence with a grunt. Lovely welcome back home, per usual. Having spent 2 months in Colombia in the past 2 years, this attitude held by many Americans toward Colombia continues to sadden me. Things are changing folks, Colombia isn’t all guerillas and cocaine, read a damn book! After checking in with a United employee we’re told with more of the Jersey rudeness that we’re pretty much screwed. And she was right as we spent a night in a motel near Newark last night. A hotel with nice sheets, an actual comforter, and most importantly HOT WATER! That was my first warm shower in 15 days. Americans don’t know how good we have it. At 9am this morning, everyone of the flights to Denver is fully/overbooked and there is a standby list of 17 people ahead of us. After visiting the service desk and learning basically every United flight was booked today, I broke down and bought a 9pm flight to Houston followed by a 6am flight to Denver. Another night in a airport sounds horrible, but at least we have seats. 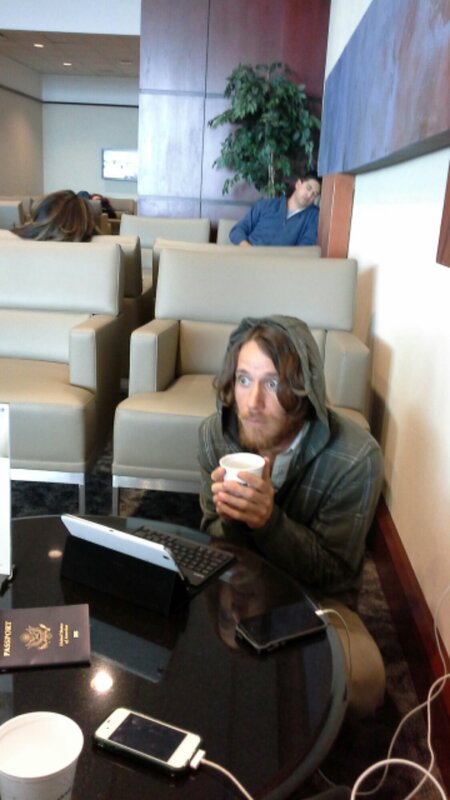 We’re currently camped out at the United Club, looking like shell shocked war refugees than the business travelers seated around us, our backpacks resulting in second glances. Something tells me we’re the only NonRev passengers here. Only 8 hours more until our flight to Houston! You can find us in the United Club enjoying delicious dark cheap beers, English tv, and great wi-fi.